The average patient assumes that a drug prescribed by his/her practitioner (1) has been proven safe and effective, (2) is FDA approved, and (3) is supported by scientific evidence. Most do not realize that the practitioner is in no way legally obligated to disclose the lack of FDA approval of the intended use of any drug prescribed to the patient. When it comes to off-label (Not FDA or manufacturer approved) uses the decision about how much information to give the patient is left up to the discretion of the practitioner. For your safety, expect your practitioners to operate within the Doctrine of Informed Consent and Shared Decision Making. ASK if the FDA condones this use. If not, ask why your doctor feels it is appropriate to use it anyway. Some off-label uses and practices are KNOWN to have unpublicized, permanent, disabling, adverse outcomes which the practitioner may deem an “acceptable risk.” Research adverse events associated with the proposed practice. You are the only one who can decide if the risk is acceptable to YOU. 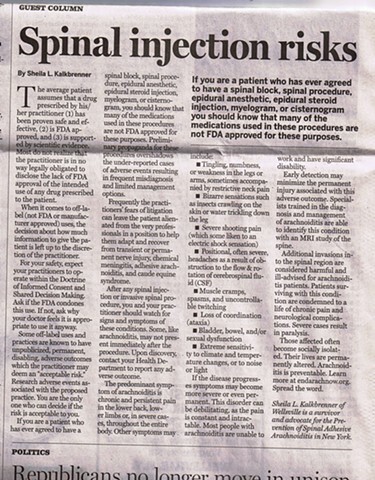 If you are a patient who has ever agreed to have a spinal block, spinal procedure, epidural anesthetic, epidural steroid injection , myelogram, or cisternogram you should know that many of the medications used in these procedures are not FDA approved for these purposes. Preliminary propaganda for these procedures overshadows the under reported cases of adverse events resulting in frequent misdiagnosis and limited management options. Frequently the practitioners’ fears of litigation can leave the patient alienated from the very professionals in a position to help them adapt and recover from transient or permanent nerve injury, chemical meningitis, adhesive arachnoiditis, and caude equine syndrome. After any spinal injection or invasive spinal procedure you and your practitioner should watch for signs and symptoms of these conditions. Some, like arachnoiditis, may not present immediately after the procedure. Upon discovery, contact your Health Department to report any adverse outcome. If the disease progresses symptoms may become more severe or even permanent. This disorder can be very debilitating, as the pain is constant and intractable. Most people with arachnoiditis are unable to work and have significant disability. Early detection may minimize the permanent injury associated with this adverse outcome. Specialists trained in the diagnosis and management of arachnoiditis are able to identify this condition with an MRI study of the spine. Additional invasions into the spinal region are considered harmful and ill-advised for arachnoiditis patients. Patients surviving with this condition are condemned to a life of chronic pain and neurological complications. Severe cases result in paralysis. Those affected often become socially isolated. Their lives are permanently altered. ARACHNOIDITIS IS PREVENTABLE. There is medical evidence (2009) that some treatment protocols can prevent permanent nerve injury and consequences if the damage is detected early, within the first three months after injury. There are additional risks with spinal injections when combined with blood thinners. From the Department of Neurosurgery August 2014.